Hidden away on Tras Street, with an unassuming entrance, we visited Kanda Wadatsumi to try out their 8-course Lunch Omakase. As you walk in, there’s 2 small private dining spaces before you reach the main seating area and sushi counter. The interior is cosy with earthy tones and feels like you’re stepping into an authentic Japanese restaurant. 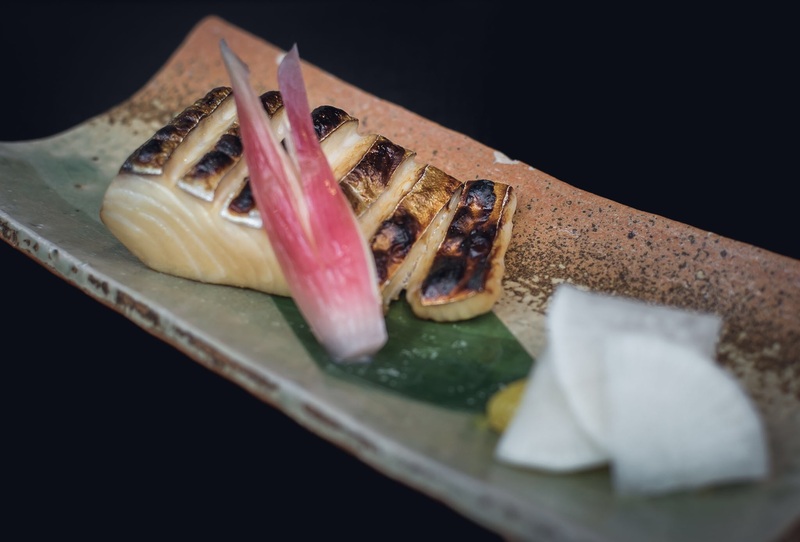 The restaurant is a partnership with the Zengyoren Japan Fisheries Association which represents all the coastal fishermen in Japan which means they have access to a wide variety of fresh seafood from various prefectures. The first course of our omakase was this Housemade Tofu that sits in a Bonito Jelly then topped with Hokkaido Uni. The tofu was more towards a thick paste texture and had a nutty flavour whilst the bonito jelly added a little saltiness to the dish. 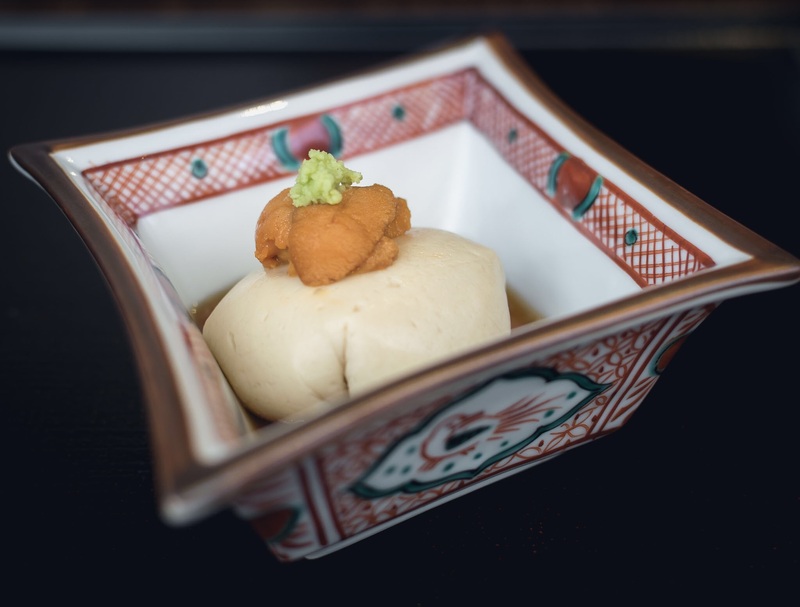 Fresh Hokkaido Uni is always welcome as it’s creamy and slightly sweet. The second appetiser, Chawanmushi, is pretty common. However, this version came as a flavour surprise. Making use of the fresh seafood available, we dug into our steamed egg to find a huge white clump that looked somewhat like a brain. We found out it was Pacific Cod Soft Roe ‘Shirako’. Basically, it’s the Cod’s Sperm Sac and the taste was well… rather distinctive. Once the outer membrane (which is slightly firm) is broken, the texture within is very creamy and doesn’t seem to melt away in the mouth quickly, but lingers with a very mellow, slightly sweet yet fishy flavour. The taste was slightly overwhelming and I guess it’s an acquired taste, but if you like creamy textures definitely give this a go! 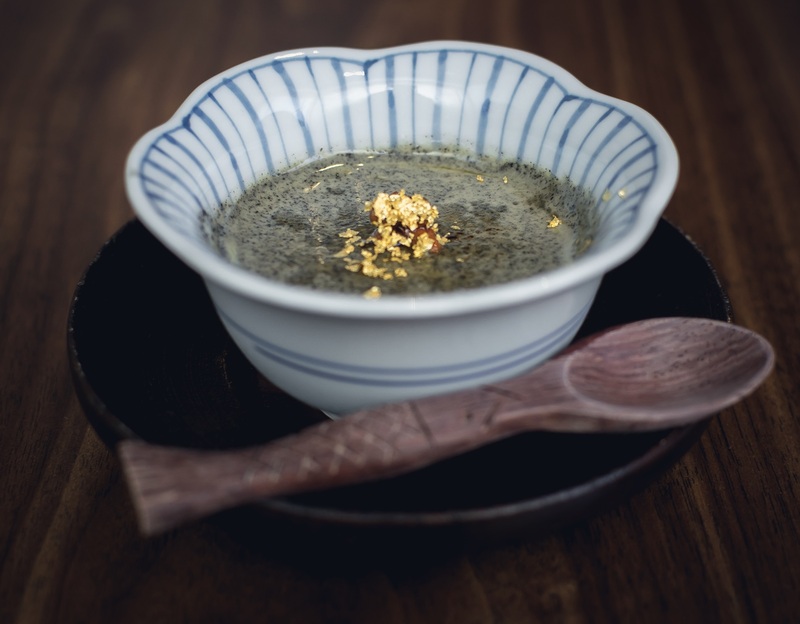 We were told however, that the feature ingredient in the Chawanmushi changes frequently and sometimes includes scallops. 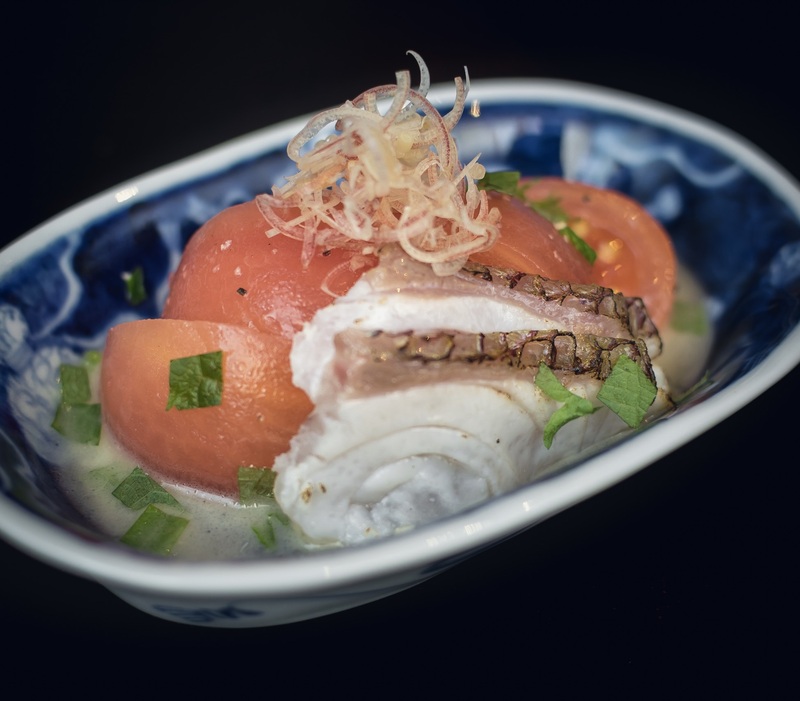 The ‘salad’ in our Omakase set at Kanda Wadatsumi was a plate of Japanese Peeled Tomatoes with slices of ‘Tai’—Sea Bream and topped with sliced shallots. The Sea Bream had a nice smokey flavour from being torched and the tomatoes were sweet and juicy—simple yet delicious. Next up was our assorted Sashimi course which came with Fatty Tuna, Hokkaido Octopus and surprisingly Leather Jacket with Fish Liver. Stalks of ‘Hojiso’ Perilla Flowers and Wasabi are included to add to your soy sauce. The Sashimi was super fresh and the Leather Jacket—a personal favourite—with it’s firm, sweet flesh was thinly sliced then folded over a pinch of liver. Leather Jacket’s are super cute fish, but they taste amazing! We were served Spanish Mackerel as the seasonal dish which came with Ginger Flower and Radish. Although the skin of the Mackerel was grilled, the fish was still moist and tender. The main course was Beef from Kagoshima Prefecture, covered with a savoury miso sauce. 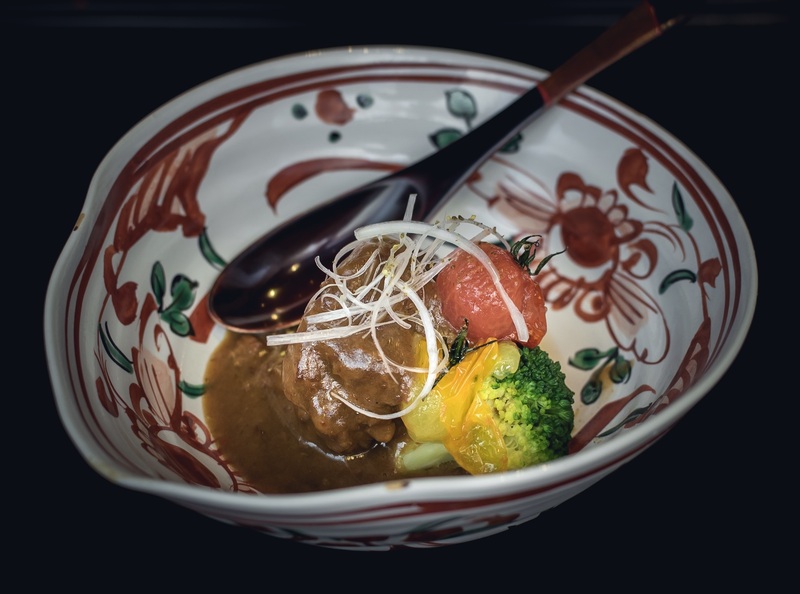 The succulent beef was tender enough to be broken apart with a spoon, which made this delicious dish simple to eat as we crossed the half way mark of the Omakase. 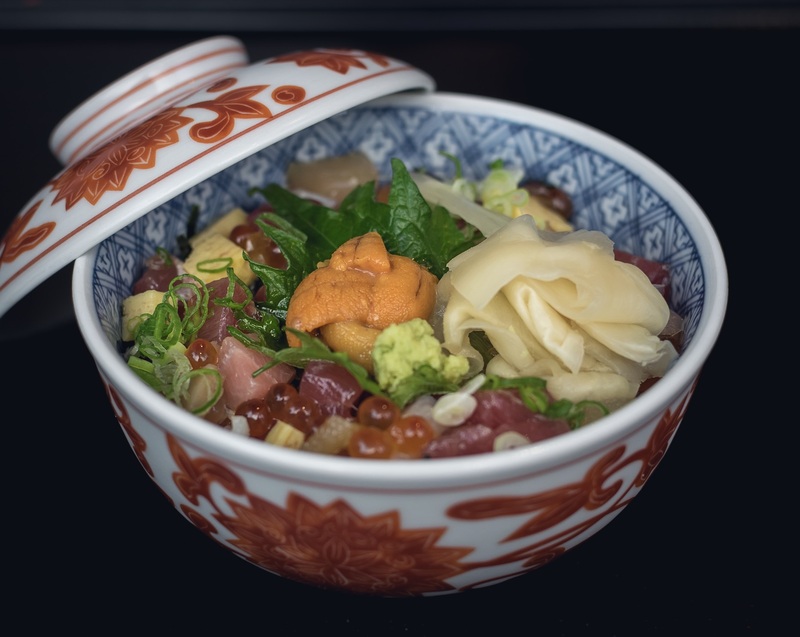 The drool-worthy ‘Shokuji’ course was a Bara Chirashi that was filled with seasonal cuts of Sashimi, Tamago, Ikura and even Hokkaido Uni on a bed of Japanese Rice. The 8-course Lunch Omakase is a lot of food with this being the most filling, so make sure you have time to sit back and savour every dish. 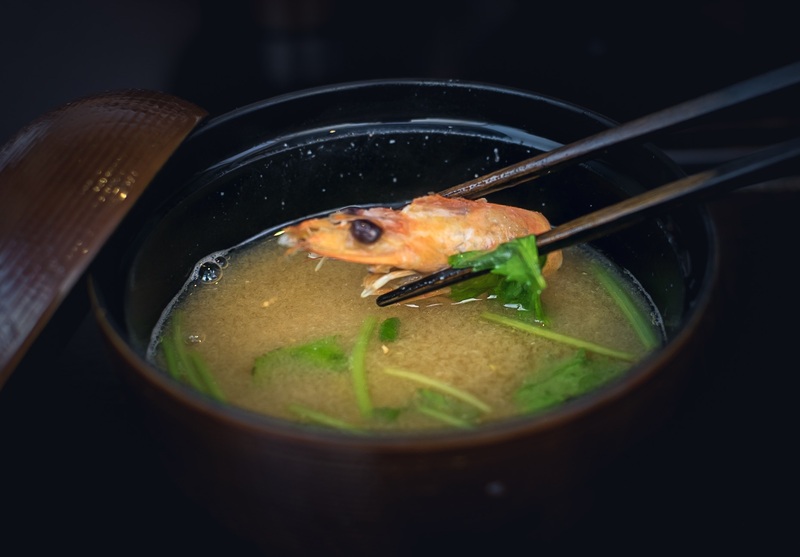 Rich Miso Soup with prawns is served with the Bara Chirashi. Nothing beats a nice warm bowl of soup towards the end of a meal. Last but not least we enjoyed a thick Black Sesame paste for dessert. A light sweetness to finish off our lunch set with very full and satisfied tummies. Kanda Wadatsumi is definitely a delicious hidden gem to visit with a date or with friends. As we enjoyed our lunch, we watched as groups of Japanese patrons visited the restaurant for their meals. Truly a well kept secret for super fresh seasonal seafood imported from Japan. There are multiple Omakase sets to choose from for both lunch and dinner starting at just $50++. Open Mondays to Saturdays; closed Sundays and PH. Previous articleNew Year Eve 2017 Countdown at Mitzo & Bar Canary!